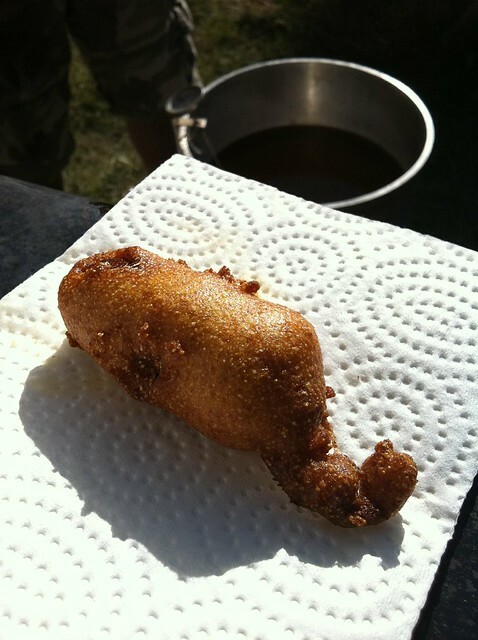 Now corn dogs are NOT a normal part of our diet but on our last camping trip of the year we had a “fry” day. Two deep friers and everything that could be fried got fried. There were fries, sweet potato fries, wings, zucchini fries, perogies, chicken fingers, etc. Friends of mine asked if I would try to make corn dogs for the kids. I agreed but subsequently left the recipe and half the ingredients at home. I decided to wing it & this is what I came up with. You can find the original recipe here. Dry hot dogs with paper towels. If you want corn dog “bites” cut in half or thirds. If you want corn dogs with sticks, insert wooden skewers or popsicle sticks into the end of the hot dog. Mix pancake mix, cornmeal, 1 cup milk, egg and salt. Mixture needs to be thick enough to stick to the hot dogs but thin enough to get a thinnish coating. Immediately drop into hot deep frying oil. Cook about 3 minutes per side until golden brown and puffed. Recipe Notes: Everyone loved these. You would never have known that I totally had to wing it. I just might have to make these. Fry day, sounds like our New Year’s Eve. We will have to try your corn dogs this year. OMG i LOVE corn dogs. i need to go buy a deep frier. “Fry Day” Sounds like it would hurt my tummy, but it would be so worth it!